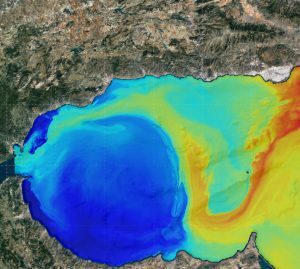 Our research vision is to develop and transform ocean modeling and data assimilation to quantify regional ocean dynamics on multiple scales. Our group creates and utilizes new models and methods for multiscale modeling, uncertainty quantification, data assimilation and the guidance of autonomous vehicles. We then apply these advances to better understand physical, acoustical and biological interactions. Our environment is collaborative within a lively group of students and researchers. We seek both fundamental and applied contributions to build knowledge and benefit society. 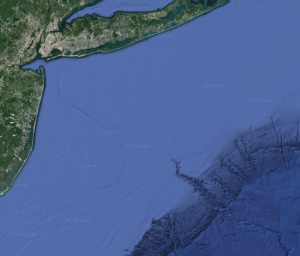 Our research includes: quantifying of ocean features and dynamics, multi-scale numerical modeling, and uncertainty quantification and assimilation schemes. 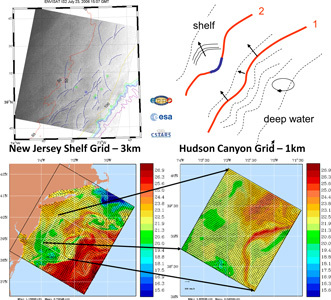 Recent results include high-order hybrid Finite-Element schemes for physical-biological dynamics at shelfbreaks (bottom left), rigorous nonlinear and non-Gaussian data assimilation using our GMM-DO filter and smoother (bottom right) and exact path planning for swarms of underwater vehicles using level-set equations (top right). 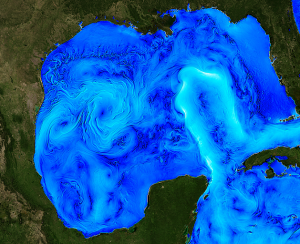 The overarching goal of this collaborative project is to achieve greater understanding of the physical processes that control the circulation in the Gulf of Mexico, in particular the Loop Current and Loop Current eddy separation dynamics, through advanced data assimilative modeling and analyses. Our MSEAS group plans to: contribute to the skill assessment and analysis of the operational modeling systems; complete targeted multi-resolution modeling experiments to study the effect of model resolution, initial and boundary conditions; illustrate our capabilities of probabilistic predictability and process analyses; and, predict the information content and impacts of observations for principled observational campaign design. Describing and quantifying the truly three-dimensional and time-dependent transports of ocean properties from the surface ocean to the interior is a fascinating observational, theoretical, and modeling challenge. The CALYPSO initiative addresses this challenge, with a focus on the southwest Mediterranean Sea region. 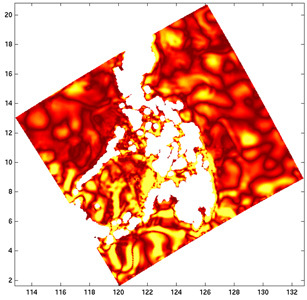 Our goal is to develop novel efficient four-dimensional Lagrangian analysis theory and methods, and apply and expand our capabilities in multi-resolution multi-disciplinary ocean modeling, uncertainty, predictability, and Lagrangian–Eulerian data assimilation, to predict and characterize multiscale ocean transports, coherent structures, and subduction/stirring/mixing processes, and optimally guide ocean platforms towards the most informative observations. 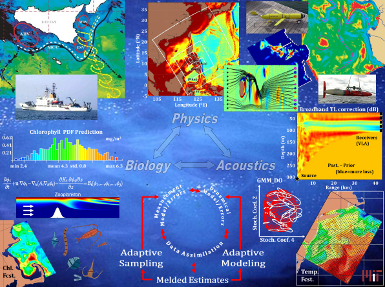 The long-term MIT-MSEAS goals of the S-DUCT effort are to (i) employ and develop our high-resolution MSEAS modeling system in ocean regimes with surface ducts, (ii) develop and utilize our coupled oceanographic-acoustic probabilistic modeling, (iii) employ and advance our coupled Bayesian data assimilation (GMM-DO filter and smoother), (iv) apply our theory and schemes based on Bayesian mutual information fields, and (v) quantify the sound speed and transmission loss variability in surface duct regions and investigate models of such effects that are useful for naval applications. One of our research thrusts is to derive and apply advanced techniques for multiscale modeling of tidal-to-mesoscale processes over regional domains (nearshore-coastal-basin) with complex geometries including shallow seas with strong tides, steep shelfbreaks with fronts, and deep ocean interactions. On the one hand, our conservative implicit two-way nesting for realistic multi-resolution modeling has enabled high-fidelity studies of coupled multiscale ocean dynamics. On the other hand, a high-order multi-dynamics modeling capability based on novel hybridizable discontinuous Galerkin (HDG) numerical schemes is also promising for seamless conservative multi-resolution forecasting. These two research topics are the backbones of our NOPP research project. Today, the number of autonomous platforms used in semi-coordinated sea operations can be larger than 10 and this number is increasing. This new paradigm in ocean science and operations calls for investigations as those envisioned by the Northern Arabian Sea Circulation – autonomous research (NASCar) initiative. The need for clever autonomous observing and prediction systems is especially acute in the NASCar region due to the frequent pirate activities and the relative paucity of in situ observations. 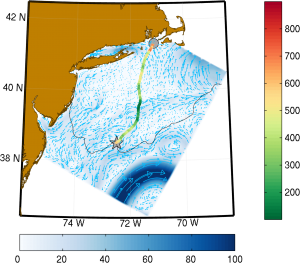 The long-term goal is to develop and apply theory, schemes and computational systems for rigorous Bayesian nonlinear assimilation of Eulerian and Lagrangian coastal flow data, fully exploiting nonlinear governing equations and mutual information structures inherent to coastal ocean dynamical systems and optimally inferring multiscale coastal ocean fields for quantitative scientific studies and efficient naval operations. The motivation is to exploit the information provided by coastal platforms (drifters, floats, gliders, AUVs or HF-radars) so as to best augment the limited resolution and accuracy of satellite data in coastal regions and to determine coastal sampling needs for successful Bayesian field estimation in diverse coastal regimes. In the ocean domain, opportunities for a paradigm shift in the science of autonomy involve fundamental theory, rigorous methods and efficient computations for autonomous systems that collect information, learn, collaborate and make decisions under uncertainty, all in optimal integrated fashion and over long duration, persistently adapting to and utilizing the ocean environment. The corresponding basic research is the emphasis of the LEARNS project. The goal is multi-resolution data-assimilative modeling to study truly multiscale coastal ocean dynamics and their acoustic effects, with an emphasis on resolving internal tides and long nonlinear internal waves and their interactions with the real ocean, including: All coastline, shelf, shelfbreak and deep ocean features; high-resolution steep bathymetry; and, atmospheric fluxes as external forcing; and, Stochastic parameterizations of sub-grid scales (nonlinear internal waves and other effects) for 4D hydrostatics models, and new non-hydrostatic HDG scheme in idealized conditions. The overall objective of this program is to conduct basic research that will help enable robust autonomy and automation in dynamic, unconstrained environments and contexts. The two science problems of interest are how a learning machine may leverage all relevant prior knowledge and how it may leverage occasional in situ availability of a subject matter expert (SME). This leads naturally to the existing research of Transfer Learning and Active Learning. The intent of the ATL program is to improve upon these two existing areas of research and combine them to produce a novel, powerful learning capability. 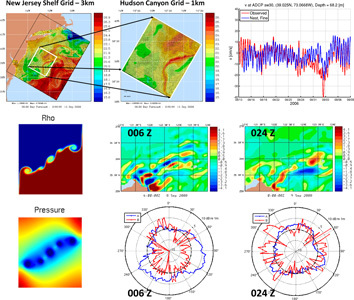 Internal tide generation and propagation near continental slopes are being studied using a four-dimensional numerical simulation and diagnosis approach. The purpose is to explain observed variability in internal tides and the nonlinear waves they spawn. The study is concentrating on long wavelength linear internal waves (internal tides) generated from subcritical tidal flow (current speed less than wave speed), ubiquitous around the world. Three internal tide effects are being examined: variable generation, heterogeneous propagation (i.e. focusing), and conversion to nonlinear waveform. Stellwagen Bank supports a multiplicity of life forms, from plankton to whales. This project seeks to mathematically model and investigate the interplay among physical and biological processes that support the productivity of the Bank’s ecosystem. 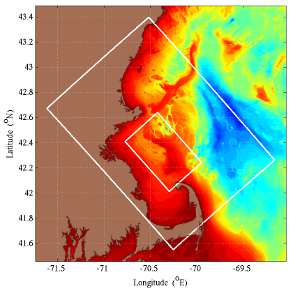 The multiscale MSEAS modeling system is being used to investigate the roles of physical features and processes in distributing nutrients and thus the production and retention of phytoplankton biomass. We research autonomous sensing swarms and formations that exploit the multi-scale, multivariate, four-dimensional environmental-acoustic dynamics and predictabilities. 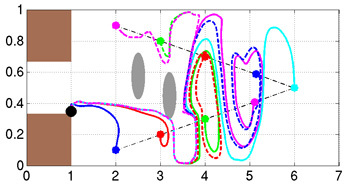 We develop new global swarm patterns and high-level optimization schemes based on control theory and dynamical system theory (e.g. artificial potential functions, nonlinear contraction analysis), artificial intelligence (e.g. hybrid evolutionary optimization, particle swarm optimization and reinforcement learning) and bio-inspired behaviors (e.g. distributed flocking/swarming, ant algorithms).